We have extremely hot summer (over 35C/95F) in Japan!!! 1. You want all the ingredients at room temperature. 2. Mix warm water, salt and beaten egg together. 3. In a large bowl, place bread flour, butter, sugar, and dry yeast. Keep the dry yeast away from butter as the salt (in the butter) will kill the dry yeast. 4. Gradually mix in the warm water mixture. Use your hand to mix together until formed. 5. Transfer the dough to the counter, stretch the dough for a few times using your palms, fold it in half, turn it around (90C), and stretch again. Repeat and knead until smooth, without adding any extra flour for 10-15 minutes). The dough should be very elastic which when stretched becomes almost translucent. 8. Place the dough onto a floured surface and punch out the air with your palm. 9. Divide it into 8 equal pieces using a bench scraper or a knife. Quickly form them into balls. 10. Place them on a baking sheet, cover with plastic wrap (to keep the surface of the dough from drying out), and rest for 10 minutes. The dough is surprised because you punched, so please let them rest for a while before you start shaping. 11. Using a rolling pin or your palm, flatten out the dough to 3-inch-wide. Then place them on a baking sheet. 13. Preheat the oven to 200C (392F). 14. Brush the dough with the leftover beaten egg, and sprinkle with some sesame seeds. 15. Bake at 200C (392F) for about 10 minutes. Place them on a wire rack to cool. * To keep the surface of the dough from drying out, a wet towel is okay but plastic wrap is easier! 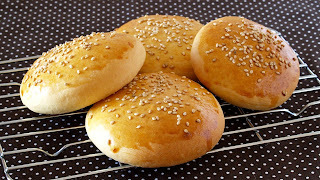 * You can freeze the buns up to 1 month. Thaw at room temperature and warm in an oven or a frying pan before eating.